Setting the Scene: During World War I of 1914-1918, the Ottoman Empire, who had held Palestine for the past 400 years, entered the war on the side of Germany and the Austro-Hungarian Empire and they were defeated. The Ottomans had carried on Genocide on the Armenians and Assyrians. This had impacted northern Syria. In the middle of the war, 2 diplomats, the French Picot and the British Sykes, secretly agreed on the post-war division of the Ottoman Empire in 1916. For starters, they separated 2 territories by a border running a straight line from Jordan to Iran, but oil was discovered in Mosul just before the end of the war. Mosul lay in northern Iraq. "The city's fortunes revived with the discovery of oil in the area, from the late 1920s onward. It became a nexus for the movement of oil via truck and pipeline to both Turkey and Syria." Now France decided in 1918 to cede this region to Zone B or the British zone of influence. When Syria became a League of Nations mandate in 1920 this border was recognized. The French held the mandate over Syria and Lebanon. The British had Palestine. At the same time in 1920, the independent Kingdom of Syria was established under Faisal I of the Hashemite family, the same family that had Trans-Jordan granted to them by the British out of the land to be the Jewish Homeland. Faisal had worked with Chaim Weizmann and had agreed to the idea of a Jewish Homeland, thinking he would get his fair share, too. After all, he and his men had fought with the British against the Ottoman Empire and helped them as much as the Jews and Chaim Weizmann had, he figured. Faisal wasn't as lucky as King Abdullah of Trans-Jordan, however, as his rule lasted only a few months. There was the Battle of Maysalun when the French troops occupied Syria later that year after the San Remo conference (see references below). That was when it was proposed that the League of Nations put Syria under a French mandate. That didn't stop Sultan al-Atrash in 1925 who led a revolt that was engulfing the whole of Syria and parts of Lebanon. He won several battles against the French who sent thousands of troops from Morocco and Senegal until 1927. The Sultan was sentenced to death but he escaped to Transjordan and was later pardoned. He returned to Syria in 1937 after signing the Syrian-French Treaty. Atassi then became the first president elected in September 1936, but the French refused to ratify it. Then France fell in 1940 during WWII, and Syria came under the control of Vichy France until the British occupied the country in July 1941. The French finally left in 1946 and Syria was again independent. It was Chaim Weizmann and others who finally were able to see that the League of Nations passed the law of making Palestine the Jewish Homeland in 1921, and in the Balfour Doctrine of 1926 The British held the mandate over Palestine and were given the job of seeing to it that it became as such. However, suddenly the Arabs from Syria and elsewhere were coming in illegally and the count by the British was not being kept. The Arab population in "Palestine" had remained static for 200 years and now was suddenly increasing. In the 1931 "Palestine" census, 23 different languages were reported in use by the Moslems, and most of those plus an additional 28 were in use by Arab Christians-and these plus 28 more were in use by Arab Christians entering Palestine. The non-Jews in Palestine in 1931 listed their birthplaces in 24 different countries in addition to the Americas and Europe. Just in Jerusalem, 20 different places of birth outside the Armericas and Europe were listed by the Moslems. those plus another 4 countries were listed by the Christian Arabs. The Mandate Commission reported on August 12, 1934, from Tewfik Bey El-Hurani, governor of the Hauran, (Syrians) that in the last few months from 30,000 to 36,000 Hauranese had entered Palestine and settled there. Syrians from the Hauran district were admitted freely to "Palestine" without any passports or visas from the beginning of the British Mandate after WWI until the 1940's.p. 231 Some Syrians had gone back to Syria to avoid prosecution for violence in the riotsof 1936. The British looked away when they entered, and the fact that they managed to settle in the Jewish-settled portions of the country. One report said, "that more Arabs entered illegally and stayed in Palestine than the total number of Jews for twice that length of time in 1934 who were "approved" to immigrate into their designated "Jewish National Home." Yet the British report only said that 1934 recorded just 1,784 non-Jews with only about 3,000 as travelers remaining illegally, and those figures supposedly included Arab immigrants from all points into all of Palestine. False Reporting!! The Jews, however, had everything about them recorded; age groups, occupations, amount of capital brought in.
" Yet, illegal Jewish immigration was fastidiously reported."p. 226. Being it was to be the Jewish Homeland, I do not see how their entrance could be listed as illegal, but it was, whereas the immigrating Arabs were not listed as illegals. This showed up when Jews finally tried to enter Palestine through Trans Jordan. Arabs were coming in that way as well, "but the Arabs were not marked illegal until their detection had become flagrant." The British Peel Commission report of 1937 said that developing the Jewish National Home had to depend on the rate and volume of Jewish immigration over many years. The Arabs were watching this immigration and were afraid of being overwhelmed and dominated by the Jewish immigrants. The British had not made any attempt to count how many Arabs had come into "Palestine" from neighboring Arab lands but they estimated that 9/10s of the growth was due to natural increase and was a growth of over 50% in 17 years. They realized the the Arab population during the Ottoman Empire of 400 years had remained quite stationary. In 1938, at the height of the Germans' treatment of their Jewish population as horrific, with all sorts of rules and regulations against them, Palestine would have been the logical place for them to flee. They couldn't get in. At first the British blamed the improved health conditions brought by Jews that was extending Arabs' lives, brought on by the appropriation of tax-revenue contributed by the Jews. They were blaming the increased Arab population on the Jews for helping the indigenous Arabs already existing there. There had been Arabs going to and from Trans-Jordan. The Peel report did mention that 4,866 "travellers" who entered Palestine during the year were registered as immigrants. Of these, 4,114 were Jews and 752 were non-Jews. By 1939, at the height of German anti-Semitism, when the last ship with Jews left their shores for the USA, leaving many to die soon in the Holocaust, Churchill said, "So far from being persecuted, the Arabs have crowded into the country and multiplied till their population has increased more than even all world Jewry could lift up the Jewish population." Had the British considered the fact that Moslems could have up to 4 wives at the same time? The Arabs had been hurling out anti-Semitic propaganda, probably hot off the presses from Germany. The British then came out with their White Paper of 1939 halting Jewish immigration at the time they needed it the most. Neville Chamberlain made it clear that Britain would only allow 75,000 Jews to enter Palestine over the next 5 years from 1940 to 1944, the height of the Holocaust period. Even at that, only 10,000 each year would be allowed in, holding 25,000 spaces in abeyance. It was almost like they were helping Germany exterminate Jews. 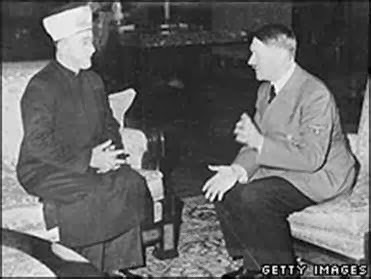 In 1941, the Arab, Haj Amin al Husseini (1897-1974), the Grand Mufti of Jerusalem from 1921 to 1948, visited with Hitler in Germany in a meeting of exterminating Jews, thus ending their chances of creating the Jewish Homeland. He was also on the side of the King Faisal, Hashemite ruler of Syria. Perhaps that's why his rule ended after a few months. Husseini was the opposite of Faisal, and was totally against Faisal making any agreements with Jews. 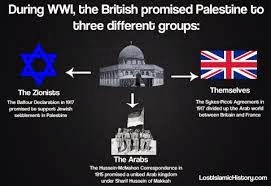 Britain left the country when their mandate was up in May 1948, probably glad to get out of there as they felt the Arabs would slaughter the Jews. David Ben Gurion addressed the world with the voting in the United Nations which said yes to their becoming a state, and minutes later they were attacked by all their Arab neighbors. The miracle of all miracle happened. They were able to hear the League of Nations and the new United Nations vote them in as a state, and they won their first of many battles against their Arab neighbors who disagreed with the majority vote. When asked who they were, the Arabs would say they were Syrian Arabs. They never said they were Palestinian Arabs until many wars later in 1967, when they again lost that very serious battle of the Six Day War. Now the leaders of other Arab nations nudged them to want their own state, after being offered the opportunity since 1947 and many times thereafter, always with the answer of no! Their leaders were holding out for taking all of Israel. Malcolm MacDonald, British secretary of State in 1938 said of the over one million Arabs in Palestine, "The Arabs cannot say that the Jews are driving them out of their country. If not a single Jew had come to Palestine after 1918, I believe that the Arab population of Palestine today would still have been around about the same figure at which it had been stable under the Turkish rule. In 1934, 42,359 Jews were registered, 1,494 Christians and 290 Muslims. In 1938, Britain registered 12,868 Jewish immigrants, 473 Christians and 1,922 Moslems making a total of 15,263. In 1939 they registered 16,405 Jewish immigrants, 376 Christians and 1,652 Moslems. In 1940, when Jews could not get out of Germany, 4,547 Jews, 390 Christians and 674 Moslems were registered. . That's what they showed on the books, but it wasn't the reality at all. Moslems were getting in illegally without being registered. 1934 was a good example where they only showed 1,784 non Jews entering when they had already listed the 30,000 to 35,000 Hauranis (Syrians) who immigrated to Western Palestine that weren't included in the British calculations. No wonder so many Arabs, when asked, said they were Syrian Arabs. They really were! They were not native Palestinians. It was learned here today that the Transjordan Government has prohibited entrance of Hauranis Syrians). The action is believed to have been taken in accordance with desires of the Palestine Government, which reportedly has instructed its police to detain all vagrant Hauranis and hold them for trial as illegal immigrants unless they returned voluntarily to their country. Ten thousand Hauranis are preparing to migrate to Palestine, confident of securing employment there and encouraged by stories of affluence among their fellows who have been there for some time, it is reported here. The thirty to forty thousand Hauranis now working in Palestine have sent home to their distressed families sums aggregating Â£100,000, it is estimated in economic circles in Syria. The thoughts of local peasantry are turning more and more to Palestine, what with the economic stress, the widespread agricultural slump, and the plan of French authorities to settle Assyrian refugees from Irad here. This latter move has aroused great indignation locally, and there have been protest meetings and protest memoranda sumbitted. At Aleppo and other places parties of Assyrian refugees have been attacked. The Hauran area is south of Damascus. Historically a border region, marking the edge of Rome's eastern empire, the Hauran has played an important role throughout history. Bosra, with its ruins that stretch back to Nabatean times and its massive Roman theatre, is an obvious highlight, but among the other small towns there are more historical gems to be found. Shahba (ancient Philippopolis) was the birthplace of Philip the Arab, the local boy who rose to Roman emperor. Suweida has a small but stunning mosaic museum and Ezraa's church lays claim to be the resting place of St George. Most of the Hauran is within easy reach of Damascus, making exploring the sights here perfect for day trips from the city. Evidently this must be where the Hauranis (Syrians) came from that Tewfik Bey El-Hurani was governor. PA President Mahmoud Abbas is facing criticism from Palestinian refugees for saying that he does not want to "flood" Israel with millions of refugees. Dr. Esam Udwan, an expert on refugee affairs, said, "Who said that there are only five million refugees? The real number is eight million. Abbas mentioned the five million who are registered with UNRWA and benefit from its services. But there are millions of others who do not receive services from UNRWA and are not registered with it. This does not mean that they should be denied the right of return." This is their demand-to flood Israel with Arabs in order to destroy it as the Jewish Homeland. Article 6 of the Mandate, charged Britain with the duty to facilitate Jewish immigration and close settlement by Jews in the territory which then included Transjordan, as called for in the Balfour declaration, that had already been adopted by the other Allied Powers. As a trustee, Britain had a fiduciary duty to act in good faith in carrying out the duties imposed by the Mandate. Furthermore, as the San Remo resolution has never been abrogated, it was and continues to be legally binding between the several parties who signed it. It is therefore obvious that the legitimacy of Syria, Lebanon, Iraq and the Jewish state all derive from the same international agreement at San Remo.